According to the Department of the Treasury, the average age of Australia’s population is increasing steadily. The Australian Government’s Intergenerational Report predicts that the proportion of Australians aged over 65 years will double within the next 40 years to make up approximately one quarter of the total population. As a result of this demographic shift, the Department of Health anticipates that by 2041 the number of people using aged care services will increase by around 250 per cent. Disability services will experience a corresponding rise in cost and importance, amounting to 14.5 percent of Australia’s GDP by 2030. This move towards an older population with a much greater reliance on aged care and disability services is expected to drive a shift in how such services are funded – with a declining number of working Australians meaning a smaller tax base – and in how they’re administered. At TechnologyOne, we’ve noted an increasing overlap in the way that aged care and disability services are organised and delivered. The Australian disability and aged care services sectors will soon be dominated by two models: consumer‑directed care (CDC) and the National Disability Insurance Scheme (NDIS). Though these two models operate independently, they have some striking similarities. For example, both have come to rely on individual funding packages, which are validated by generating individual invoices. And while CDC is, notionally, a more customer-centric model, both systems emphasise the need to increase patient autonomy, as well as heightened accountability among service providers. Of course, there are compelling reasons for the two systems to continue running independently of each other. For example, the report notes that “the kinds and persistence of disability are more varied than in the aged care system, [and] require a greater diversity of responses”. However, what we’re concerned with is the freedom of patients to access the services they need, and the ease with which medical organisations in the aged care and disability services sectors can provide them. To ensure this flexibility, there’s no better solution than a carefully implemented enterprise system that empowers service providers to track customer progress, automate funding requests and concentrate their resources on delivering high-quality patient outcomes. This enterprise system must take into account an organisation’s entire operations, providing a fast, software-based approach with a single, centralised solution. This is in stark contrast to the way most Australian medical providers currently operate. According to a report by the NSW Agency for Clinical Innovation, “older people, their carers and family currently have multiple, disconnected and often duplicative interactions with the health system”. And there’s a clear need, argues the report, to replace this piecemeal approach with “integrated service delivery that shares information to effectively support multi-sector decision making”. Enterprise systems achieve this outcome by ensuring that each aspect of patient care – from front-office functions such as medication management to back-office functions such as recruitment of appropriate medical personnel – is managed by connected software programs. Information can then move swiftly and securely from one system to another. This allows care providers, for example, to access relevant patient histories. Patients, for their part, can delegate the financial aspects of their care (such as rebate applications) to medical providers. Such an approach enables medical providers to focus on improving patient outcomes, and also provides the transparency necessary to increase efficiency and monitor compliance with any internal processes or external regulations. As the aged care and disability services sectors continue to share patients over the coming decades, flexibility will be increasingly critical for both patients and medical organisations. It empowers patients to choose an appropriate care plan, and organisations to manage it in an affordable and timely manner. Enterprise systems offer a reliable way for medical providers to maximise their flexibility, giving them a valuable competitive edge, as well as the ability to offer a streamlined and adaptable service to their patients. Sean Tuckett is the Industry Manager for Health and Community Services at TechnologyOne. Sean has more than 25 years experience in senior corporate, commercial and strategic roles across a diverse range of industries including multinationals and government. 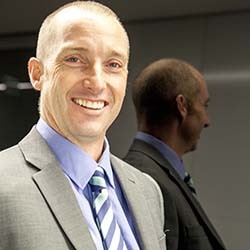 During his tenure with TechnologyOne, Sean has undertaken a number of key roles including sales management, service delivery, staff training and development, strategic planning and industry engagement with peak bodies including.